BUTLINCAT's BLOG: "Arise, Sir Ringo" - Wogblog - Ringo gets his knighthood 50 years after getting his M.B.E. 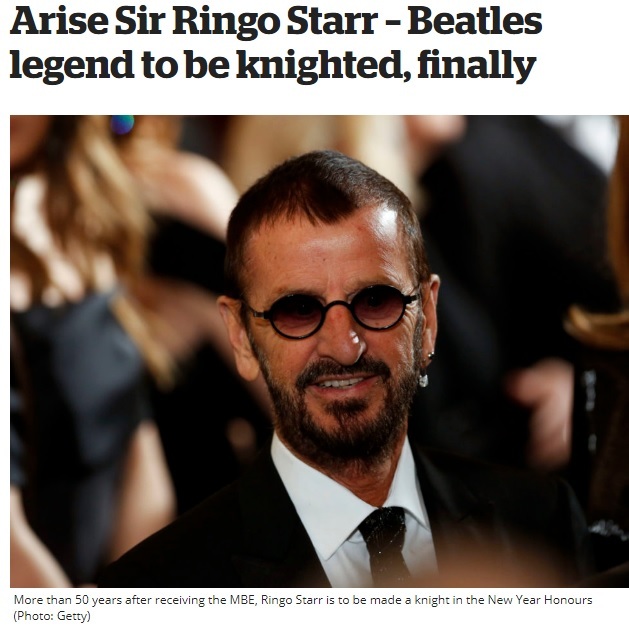 "Arise, Sir Ringo" - Wogblog - Ringo gets his knighthood 50 years after getting his M.B.E. Still from the film Lisztomania. Several UK newspapers are reporting that a certain Richard Starkey MBE, is one of the the names on Queen Elizabeth II's New Year's Honours list over who are going to be knighted in 2018. This is something Ringo can't have dreamt about when he recorded the song Elizabeth Reigns for the album Ringo Rama i 2003. After the song finishes, we can hear him say: "Well...there goes me knighthood"! The news was first published by scandal paper The Sun, but has since been confirmed by The Daily Mail, The Mirror, as well as other, reliable sources. We have to admit that there has been a bit too many of these knighthoods of late, after Paul McCartney was knighted in 1997 at the age of 55. After that, Elton John, Mick Jagger, Rod Stewart and Ray Davies have all been honoured this way. Neither John nor George received this honour, but George's friend and teacher Ravi Shankar was knighted in 2001. Ringo is said to be "chuffed to bits" about the news, but the official announcement will be made on January 1. In the summer of 2018, Ringo and his All Starr Band is undertaking a European Tour, but no British dates have been announced. BEATLES legend Ringo Starr will be knighted in the New Year’s Honours. The drummer, 77, is recognised for services to music and charity. His gong, for lifetime services to music and charity, in the New Year’s Honours will be formally announced next week. A close family friend said: “It came as a bolt from the blue. A source added: “He’ll feel ten feet tall when he goes back. "Sadly, two of the Beatles, John Lennon and George Harrison, are no longer here to be honoured in a similar way. “But giving Ringo a knighthood will go some way towards recognising the enormous contribution The Beatles made to popular music. When it was suggested he could ask the Queen to knight Ringo, Macca replied: “The last time I went by she was out. His dream came true when his stepfather bought him a drum kit for Christmas 1957, and he promised to be “the best drummer ever”. JOHN Lennon claimed the band smoked dope in a palace loo before getting MBEs in 1965. Ringo has always insisted he cannot remember. Lennon gave back his medal in 1969 in protest at the Vietnam War. Pop historians believe Ringo’s comedy and acting talents were as important as his musicianship, providing the key ingredient of humour and stability that kept the group together. He is credited with inventing the phrase A Hard Day’s Night which became a hit single, album and film. It followed a long day in the studio when Ringo collapsed in a chair and panted: “I’m bloody knackered, man. Ringo was given at least one song to sing on every album, his most popular numbers being With a Little Help from My Friends and Yellow Submarine. After the band broke up in 1970, he released several successful singles including It Don’t Come Easy, You’re Sixteen, Back off Boogaloo and Photograph. He also made a new career in TV and film and was loved by a generation of kids for narrating cartoon Thomas the Tank Engine and Friends. RINGO has entertained us for years with his comments — some of them daft, some genius. Here are six of his most memorable quotes . . .
Drumming is my middle name. The Beatles was a short, incredible period of my life. I had 22 years leading up to it, and it was all over eight years later. I never studied anything really. I didn’t study the drums. I joined bands and made all the mistakes on stage. People only look at me as a Beatle, but my friends look at me as a whole person. That’s how life works, but it’s not bugging me any more. The couple split in 1975 and he married actress Barbara Bach, who played a Bond girl in 1977’s The Spy Who Loved Me. Ringo has said Britain should get on with Brexit, calling it a “Great move”. He said recently: “The people voted and they have to get on with it. Arise Sir Ringo Starr – Beatles legend to be knighted, finally More than 50 years after receiving the MBE, Ringo Starr is to be made a knight in the New Year Honours (Photo: Getty) Padraic Flanagan 3 daysMonday December 25th 2017 Ringo Starr, the Beatles drummer, is set to be knighted in the New Year’s Honours, it has emerged. The 77-year-old musician will join his bandmate Sir Paul McCartney as a knight, 52 years after receiving an MBE. Sir Paul was knighted in 1997 but, according to newspaper reports, Starr had given up hope of a further honour until a letter arrived from the Palace several weeks ago.